Jaded Blossom: Guest Designer, Jessica! Today is my Guest Designer Post for Jaded Blossom!!! If you follow my blog, you know they are one of my FAV'S! I have been a Jaded Blossom Stalker for quite some time now, so imagine just HOW EXCITED I was to be get the chance to had a day to myself using their awesome products for their birthday month!!! So, time to show you my project!!! This year...with my hubby being out of work, money is SUPER TIGHT...But, even with money being tight, I still want to be able to show my co-workers, friends, and neighbors some Christmas Cheer! I thought and thought about what I could do for them, and then I thought of it! I pulled out my Jaded Blossom stash and went to town, and that's how my project was born! 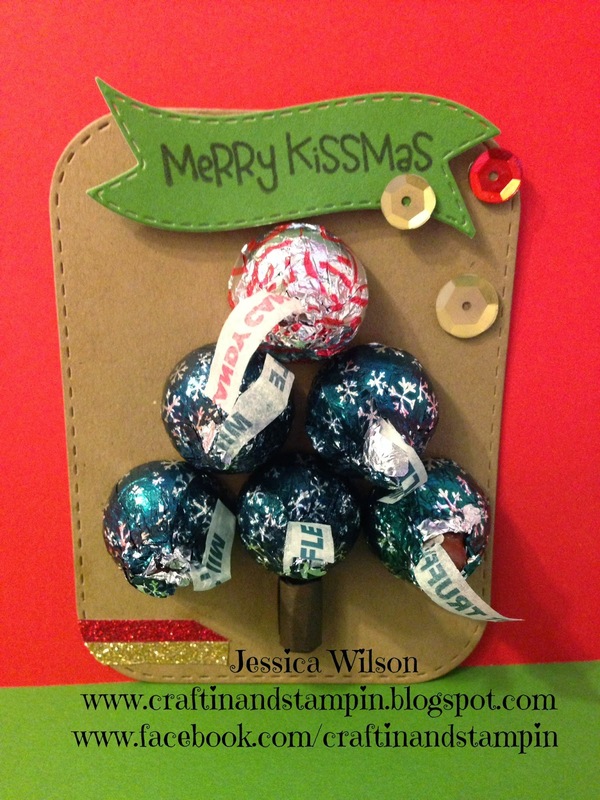 I made a "KISS-mas Tree" for them with my stamps and dies!!! Cost me about $8 in Hershey Kisses! Everything else I had in my stash!!! 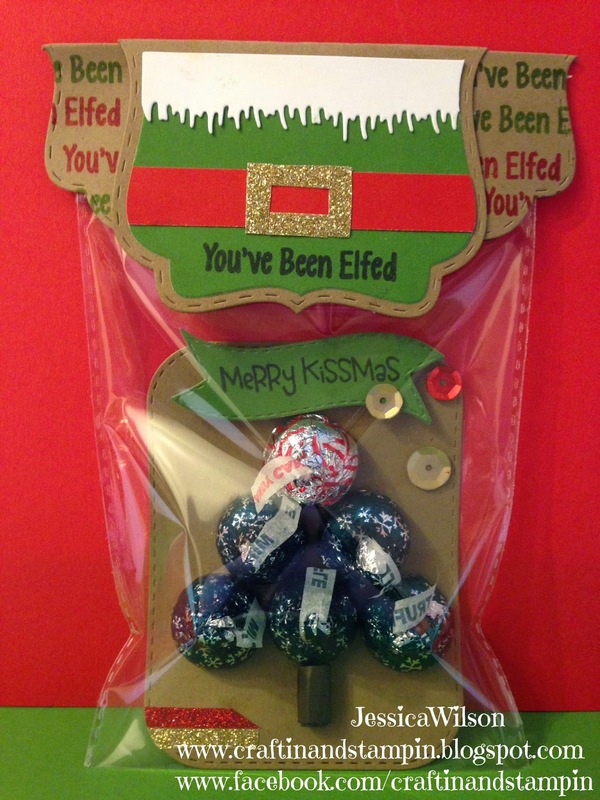 Jaded Blossom Stamps: Merry and Bright and Elf Workshop (which was RAK'd to me)! Embellishments: Close To My Heart Ruby Shimmer Trim, Gold Shimmer Trim, Gold Sequins, Glue Dots. Thanks SO MUCH for checking out my post today! And thanks Candace and Michelle for giving me a chance to help you celebrate your birthday month!!! That is too stinkin' adorable. I love it. This is SOOO cute and clever! LOVE the way you made the Christmas tree out of the kisses! Super cute! So cute Jessica! These turned out really cute! LOVE THIS! Such an awesome idea! These are soooo cute! Love your kiss as tree... Great use of JB goodies. Jess, I love this idea!!!!!! Awesome! Adorable! Love how you stamped the background paper too! Really cute and what a fun idea! this is such a great idea. i'm so on the fence about doing co-worker gifts, but this might push me over the edge! I can do this! thank you for a great idea! Yummy tree. My students sure would like this. This turned out so cool! I love the kisses tree. Lovely tree! I never would have thought of that! LOVE the tree of kisses! Shut the front door?!?! I love it a kissmas tree---brilliant!